Chris Christie’s Trump endorsement, explained. 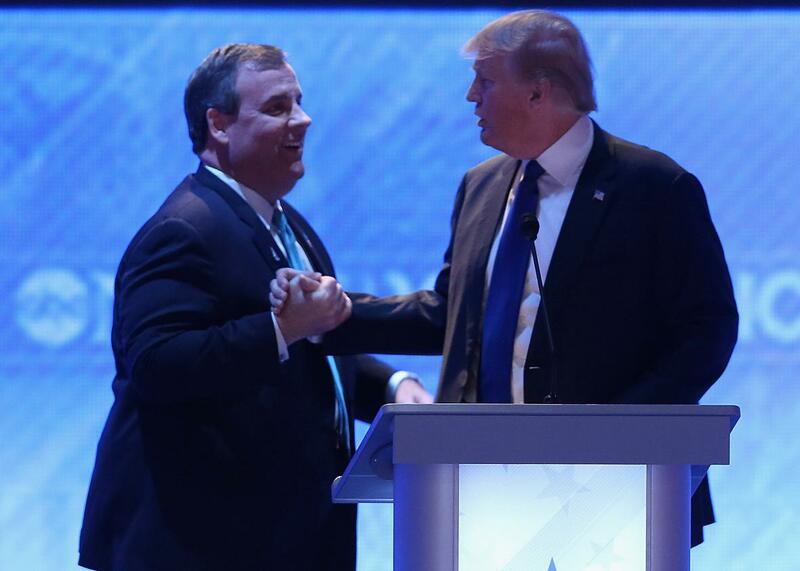 Chris Christie and Donald Trump shake hands during a commercial break in the Republican presidential debate at St. Anselm College Feb. 6 in Manchester, New Hampshire. On Friday afternoon, Chris Christie endorsed Donald Trump for president. It was a move no one saw coming. CNN and the Huffington Post both called it a “surprise,” the Washington Post and Politico went with “stunning,” and the New York Times described it as a “major turn in a wild race.” Here at Slate, I reached the same conclusion. Christie spent months running in the so-called establishment lane against Marco Rubio, John Kasich, and Jeb Bush, and it stood to reason that Christie would eventually throw his support to one of those party-approved candidates—and that he meant it when he said things like, “We do not need reality TV in the Oval Office right now.” Christie and Trump also clashed repeatedly while the New Jersey Republican was still in the race, fighting over whether thousands of Muslim Americans celebrated on 9/11 as Trump claimed (they didn’t), whether Trump’s plan to bar Muslims from entering the country is ridiculous (it is), and whether Trump has the necessary temperament and policy knowledge to be the commander in chief of United States (he doesn’t). And, as my colleague Ben Mathis-Lilley reminds us, Trump accused Christie of conspiring to commit bridge-themed fraud, and Christie literally put Trump’s daughter’s father-in-law behind bars a decade ago. So, yeah, we can all agree this was an unexpected plot twist. If Christie has no interest in public office after he’s done in Trenton, backing Trump makes even more sense. Say what you want about the Donald’s business acumen and ethics—Slate has!—but he’s clearly a good friend to have if you’re eager to make money in New York City or beyond. That’s true whether Trump’s working in the White House or in Trump Tower. Bucking the GOP and donning a Make America Great Again hat will also make Christie more attractive to cable news networks looking to hand out lucrative contracts down the road. Fox News still doesn’t know exactly what it wants to do with Trump, but it’s clear they want him on TV. By hitching his wagon to the former reality television star, Christie becomes that much more interesting to the Fox brass. He’ll certainly get a lengthy tryout as Trump’s new surrogate this spring. In the end, then, Christie is most likely backing Trump not out of spite toward Rubio (though that is certainly an added benefit), but instead for the same reason politicians on both sides of the aisle make most of their decisions—because it’s in their own self-interest. If Trump really does win the nomination, that’s the same reason we can expect many of those Republican who say they despise Trump today to eventually change their mind.